Many executives focus too narrowly on the financial side of their business and neglect the importance of communicating with their employees, the media, and the public. World Class Communication equips you with crisis lessons, procedures, and examples that could help your company save millions of dollars through proper preparation and response. 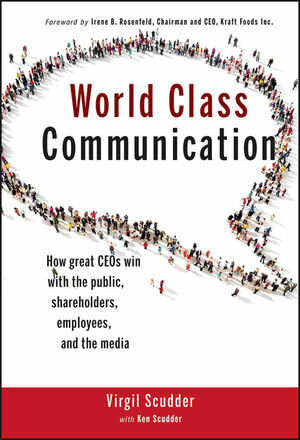 The must-have book every CEO needs, World Class Communication is packed with examples of good and bad handling of countless situations and expert instruction on how to manage them without breaking into a sweat. There is a great, and often irrational, fear of the media among CEOs, with too few executives truly knowing how to deliver a message effectively in an interview. World Class Communication delivers the necessary tools and techniques you need to communicate your message to your target audience—from shareholder meetings to corporate communications to handling crises. VIRGIL SCUDDER, president of Virgil Scudder & Associates, has trained and counseled heads of major corporations for over thirty years, serving in two dozen countries on five continents. Often referred to as "the dean of media trainers," he is a prolific writer and speaker. From his New York base, he regularly comments on current management issues on his blog and in his quarterly column, "In the C-Suite," which appears in each issue of The Public Relations Strategist. KEN SCUDDER is a writer and communication trainer and consultant. He cofounded Virgil Scudder & Associates in 1990 and, along with having bottom-line responsibility for the office, has conducted media, crisis, and presentation training programs in the U.S., Africa, and Europe.